New ESPN deal with Big 12! Adds $8mil a year to their existing deal if my Coog math is correct? That figure is interesting. Also creates a de-facto B12 network on ESPN+. I find it interesting that we will be competing in that space directly with the B12. Edit: No OU or UT content is also interesting. B12 goes back to Big8! Nothing is changing in that regard. No school was moving before '25, when their media rights deal would be up anyway. This deal goes through '24. 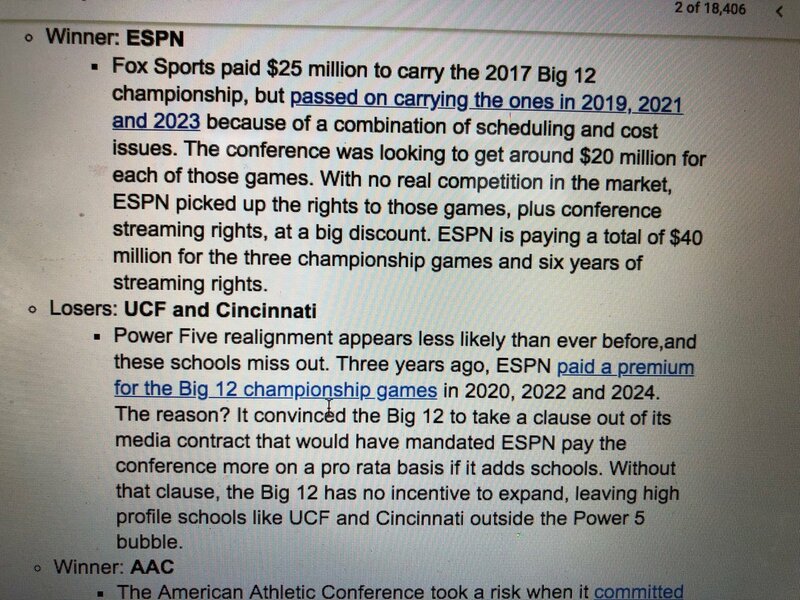 I think this is just a move from ESPN to consolidate the B12 lower tiers to ESPN+ as well as create that B12 ‘network’. Notice that they’re not launching a real network like they have for the ACC. LHN will continue as well as whatever deal OU has for their content. It will have UT and OU away conference content, so only half content from the 2 main schools. Also note there is no extension of the GoR. But in the end they see an immediate increase that is greater than the AAC payout for its first several years. Clearly ESPN has the money to be making offers like this, just not for the AAC. Is that for football or other sports? I wasn’t clear on that. I saw UT people saying that baseball etc would still be on LHN and it was only for the other 8 for non-football sports. But, like I said, I wasn’t clear on that. Yes, for all the crying about loosing money, ESPN is going all in and spending money on getting content for ESPN+. Clearly ESPN has the money to be making offers like this, just dont want to fo it for the AAC. Does it matter whether they can’t or chose not to? The end result is the same. According to a tweet by Dennis Dodd’s, the Big 12 basically lost a $75 million deal with Fox and got a $40 million deal from ESPN because there was no other bidder for Big 12 content. The Big 12 is Texas, OU and hot garbage. I see Texas and OU to the B1G in 2023 and UH plus Kansas or Tech to the PAC 12. Perhaps all 3 plus Ok State if PAC 12 goes to 16. Ideally UH and Kansas to ACC is my first choice. Bottom line is UH has the opportunity to be as or more attractive than just about every other remaining Big 12 school, outside of Kansas (basketball and AAU). UH’s biggest problem with being included in the Big12 is that our aspirations are not to be simply to be Big 12 worthy. We already are, everyone knows that. We want to be excellent at the revenue sports which is why Texas and OU don’t want us in the Big 12. Texas wants pretty good teams that they can dominate that still draw good fan support. That simply isn’t UH. Is Texas scared of us? No, but from a what’s best for Texas standpoint , they don’t want us elevated. They get nothing from a school that isn’t content with being pretty good. OU feels the same way. I’m glad another P6 is having content on ESPN+. Validates the AAC. Yes the other P6s swim in money like Scrooge on Ducktales that doesn’t change and won’t change anytime soon. P6? You really believe the AAC slogan? Sorry 51 but Texas is afraid of us. When “the coach that shall not be named” left us we offered to cut couple of million dollars off the buyout for a home and home. We had a check for the full amount the next day. That’s doesn’t prove they are afraid of us. It only proves that the money we were offering them wasn’t worth their time. Moncoog i think you’ll find the amount they pay rice vs the amount we were offering is staggeringly different. They could have had a houston game and saved 3 million dollars (difference between coach payout/rice payout) yet they declined. While I agree that doesn’t mean they are scared of us, it does mean they are willing to lose 3 million to NOT play us. That is absolutely bonkers in my mind, regardless of the reason. But hey, what’s 3 mill when you get $450 million annually from the oil reserves? Yes it does…they didnt take the offer. That was fear.